Small update: Jayden just turned 5.. CRAZY!!! I can't believe how fast she's grown.. Maybe sometime in the next week I'll have a full baby update on Jayden & Harmony (3 WHEN did that happen?!). I just finished up this layout. I followed a sketch and a color challenge. I cut all the snow flakes and the title with my Silhouette Cameo. All of the paper is from my stash. Such a wonderful OLW, Jamie! 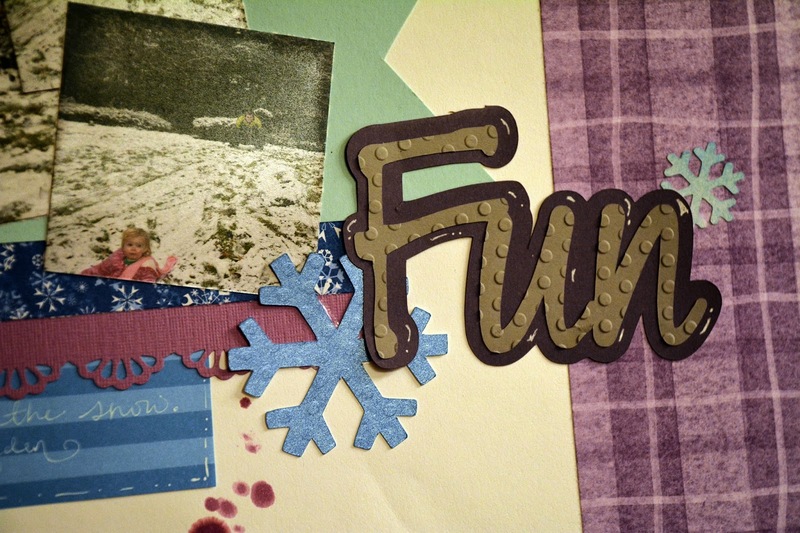 I really like your "fun" photos!!! Looks like it was a great time! Thank you so much for joining us at Challenge YOUrself this month - we are really happy that you did! Very nice page and great job with the challenge! Thank you for linking up with Scrap Our Stash! 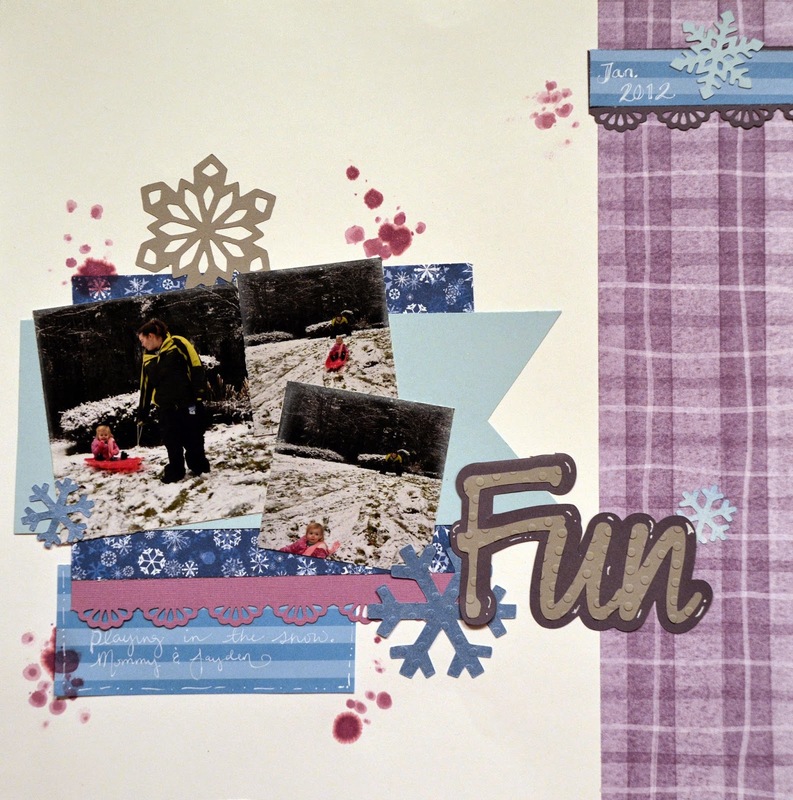 I love your colors for this winter page and nice touch with your ink splatters. Great take on the sketch. Thanks for joining in with us at Stuck?! Well done! Love the ink splatters and the color scheme. Thanks for playing along at Scrap Our Stash!! Great use of the ScrapMuch? colour challenge and Stuck?! Sketch! Thanks for playing along with both ScrapMuch and Stuck?! Great page, love the addition of embossing on your fun title! Great take on the sketch and colour challenge! Thanks for joining us at Stuck?! and ScrapMuch?! Great page, awesome job on the challenges! thanks for joining us at Scrap Our Stash and Stuck?! Beautiful page! Love that embossed title!! Thanks for playing along with us at ScrapMuch? Love, love, love the colours you chose for this layout. And those splats! LOVE! Thanks for playing along with us over at Challenge YOUrself! Gorgeous page. Great papers. Fabulous job with the colour challenge. Thank you for sharing with us at ScrapMuch? Awesome layout! You do have 2 beautiful little girls! Thank you for playing along with us at Scrap Our Stash! awesome layout! great choice of embellishments. thanks for joining us at scrap our stash. Wonderful take on the TWINE challenge. Thank you for joining us at Scrap Our Stash. Fabulous layout!! Love all the layers and embellishments! Thanks so much for linking up at Clique Kits! We hope to see you again for the February challenge! FUN ! oooh great choice for your OLW. Now how cute is your page, loving the pictures. Yes time flies by soo fast when we see our kids grow up, enjoy every moment. Thanks for playing along at Challenge YOUrself. Oh my, love that purple and blue together! Thanks for joining in on our fun at Challenge Yourself!